Whirlpool stackable washer and dryer models received a major upgrade in 2019. All models with the exception of the compact washers have received additional feature upgrades and became more roomy. Whirlpool has been a true American success story since 1911. It is the company which made modern family life easy by countless innovations. As an industrial giant, Whirlpool even played a role during World War II by converting its factories to produce armament. In addition, for over 100 years - until their recent falling out - Whirlpool supplied all appliances for Sears' Kenmore brand. 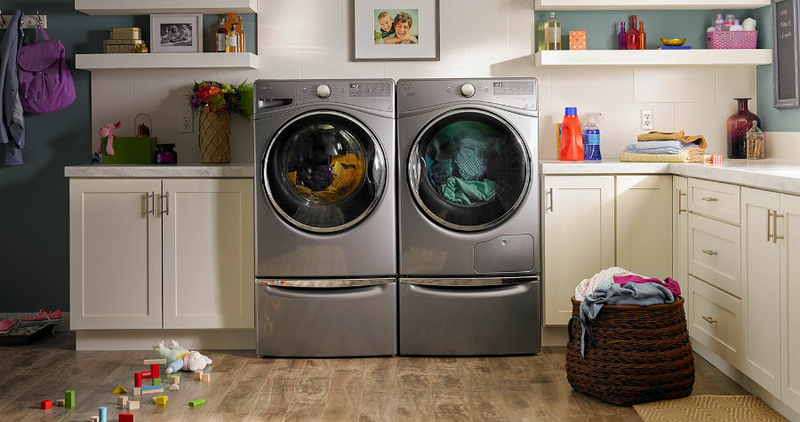 Whirlpool makes 6 different styles of front load, high-efficiency washers, and dryers. In addition, 24" compact apartment size laundry, commercial grade front load washers and legacy laundry centers enrich Whirlpool's offering. As a result, we came to notice that Whirlpool has a solution for every budget. Naturally, more advanced features are reserved for more expensive models. (i.e., detergent dispenser which can hold 12 loads worth to eliminate minor hassles out of our day). Attention to customer needs is paramount with Whirlpool. Therefore, they are the only manufacturer that tumble your wet clothes gently for 12 hours and pump fresh air to the drum. This way should you go out to run an errand during the wash cycle you will not have the musty smell due to the extended stay in the drum. Compact / Apartment Size Stackable Washer and Dryer WFW5090GW Available with Ventless Electric Dryer. Commercial Grade Washer and Dryers with or without Coin Operation. CHW9160GW (non coin), CHW9150GW (coin). These models are not designed to be stacked. 4.3 cu. ft. Relatively large capacity for a full 27" width yet shallow depth (depth - 31 9/16") washing machine. Single Load Dispenser: Add detergent, bleach and fabric softener to their designated compartments so each gets dispensed at just the right time during the cycle. Intuitive Controls lets the washer guide you to the right cycle combinations or customize up to 35 of your own to get the right type of fabric care for whatever you're washing. Presoak Option lets you skip soaking outside of the washer. Extra time is added in the washer before the wash cycle, which starts automatically when the option is complete. Sanitize cycle with Oxi eliminates 99.9% of common household bacteria by mixing detergent with an oxi additive. Single Load Dispenser: This is an important feature shared across of Whirlpool washers. It ensures that detergent and other additives are released at the correct time during a given cycle for optimal fabric care. Smooth-Wave Stainless Steel Wash Basket: Another feature shared across the board with Whirlpool washers. Whirlpool invests in quality stainless steel drum manufacturing. Both the quality of stainless steel and the specials patterns on the drum helps protect fabrics from fraying and snags. 14 wash cycles: Specialized programming that will clean all types of fabric from delicates to jeans. You are able to adjust cycles for soil level and use options such as extra rinse to regulate water usage. Pairs with standard electric wed560lhw or gas wgd560lhw vented dryer or electric ventless heat pump dryer companions. Steam Option gets detergent and steam to penetrate fabrics with the help of increased wash actions and heat. Great in removing everyday soil and stains. Load & GoDispenser detergent reservoir holds enough detergent to wash up to 20 loads of laundry so you can simply fill it and forget it. Pairs with standard electric WED5620HW or gasWGD5620HW steam dryer companions. Pairs with standard electric WED6620HW or gasWGD6620HW steam dryer companions. Wash and Dry Option: Let the washer keep laundry moving for you by adding this option to select wash cycles. After washing ends, it uses hot air to tumble dry clothes right in the washer. 12-Hour FanFresh Option Say good bye to musty smell of the forgotten wash-load. FanFresh will tumble your clothes for up to 12 hours and inject ambient air into the drum. Pairs with standard electric WED8620HW or gas WGD8620HW steam dryer companions. Pairs with electric ventless heat pump dryer WHD862CHC. Wi-Fi Connectivity: Care for your family from your smartphone or tablet. Pairs with standard electric WED9620HW or gas WGD9620HW steam dryer companions. Slim 24" width with 2.3 cu. ft. capacity and shallow depth at 25 1/8" ideal for apartments. Pairs with WHD5090GW Ventless (i.e. gives you many placement options), Heat Pump electric dryer. Heat pump technology will help you save energy. In addition, it protects your garments as it does not use super high heat to dry. You will find the best features of Whirlpool engineering in this pair including TumbleFresh and Wrinkle Shield along with 10 cycles and 10 options to customize your clean by fabric type. Whirlpool's commercial laundry comes in 2 flavors, namely, coin operated vs non-coin operated. Both models are designed to handle heavy duty usage. Ideal to wash work clothes in industrial settings, for multi-unit apartment buildings, sports clubs/spa's and inn's. Interesting to note that the Electric dryers that pair with the commercial washers are able to operate at 120V which makes installation easier are more cost effective. On the other hand, don't expect to have frills such as steam assisted washing or drying in commercial laundry. They are just designed to do cleaning load after load without frills. These models are not designed to be stacked. Their shallow depth, relatively inexpensive price points and no frills approach make them appealing. Comes as 24" or 28" in width. They can be powered via Gas or 240V electric. Long vent versions are ideal for apartment complexes where up to 125' of venting is required without impacting wash/dry performance. Whirlpool stackable washer and dryer sets are designed to handle any load. We are most impressed by their advanced feature sets such as Load and Go bulk detergent dispenser and the FanFresh system. Steam drying is incorporated into most of their products and allergy sufferers will be happy about it. You will not go wrong with this all-American brand.